We’ve driven through Champagne Country, gone off the beaten path in Provence, and taken a long bike ride through Loire Valley, but France still has way more to offer in terms of travel adventures. Today, we’re headed to beautiful Strasbourg! As the official seat of the European Parliament, Strasbourg is a bustling city that sees a lot of international travelers. In contrast to its many official buildings that house various European institutions, the historic center, the Grande Île, is romantic and fully “French”. 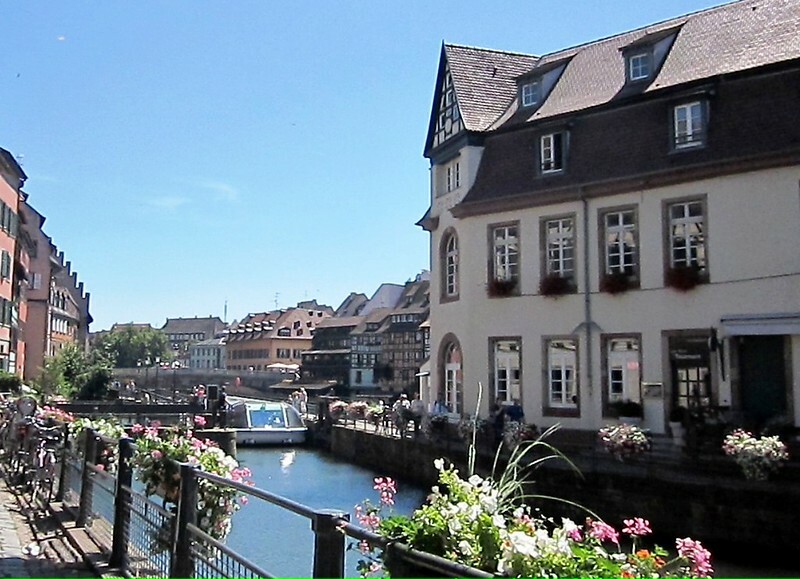 To get a feel for this unique destination, guest contributor, Tatiana Claudy, is here with some do-it-yourself travel advice as she takes us on a self-guided tour of Strasbourg, France. 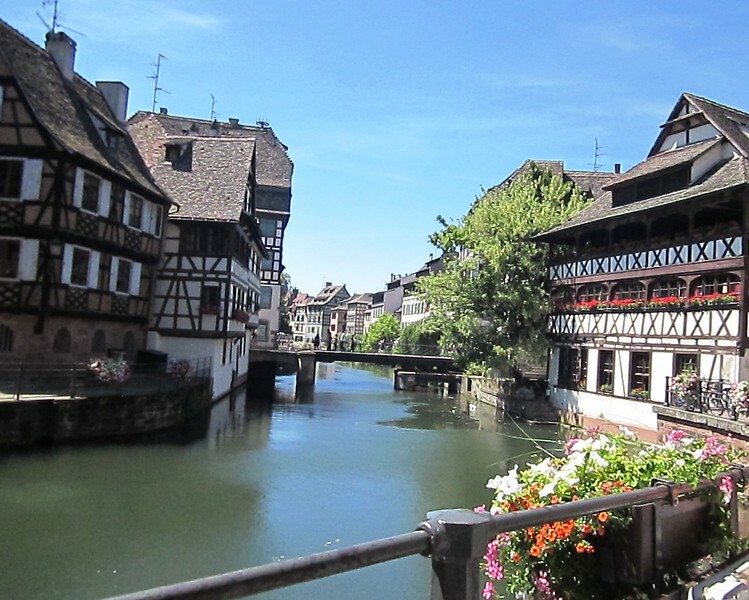 Is Strasbourg, France, on your European boomer travel list? You should include it to experience a unique blend of German and French cultures that this capital of the Grand East (former Alsace) region offers. “Strasbourg” in German means “the city at the crossroads,” and this name is justified: founded around 1300 BC as a settlement of the Celts, it was turned into a Roman military colony around 20 AD; later the city had changed its “citizenship” several times being claimed by the Germans and the French; finally, it became a part of France. Naturally, Strasbourg is abundant in tourists’ attractions. Yet in my self-guided tour I included the most significant landmarks to discover different stages in the city’s fascinating history. Let’s put on comfortable walking shoes and start our journey! In Strasbourg, riding a tram is a convenient way to get around the city. You can purchase tickets at the tram stations – at kiosks or ticket machines – but not on the tram. Before boarding the tram, validate your ticket in the validator at the tram station. To allow the validator to “read” your ticket, do not fold it. Beware: there are fines for riding with a non-validated ticket (or without a ticket). Finally, keep your ticket during your ride to be able to show it to ticket inspectors. The Louise Weiss building of the European Parliament was named after a French author and feminist. Strasbourg is among de facto;capitals of the European Union (along with Brussels and Luxemburg), thus, I started my tour with the European institutions. I took the tram line E (direction Robertsau Boecklin) till the “Parlement Européen” (European Parliament) stop. 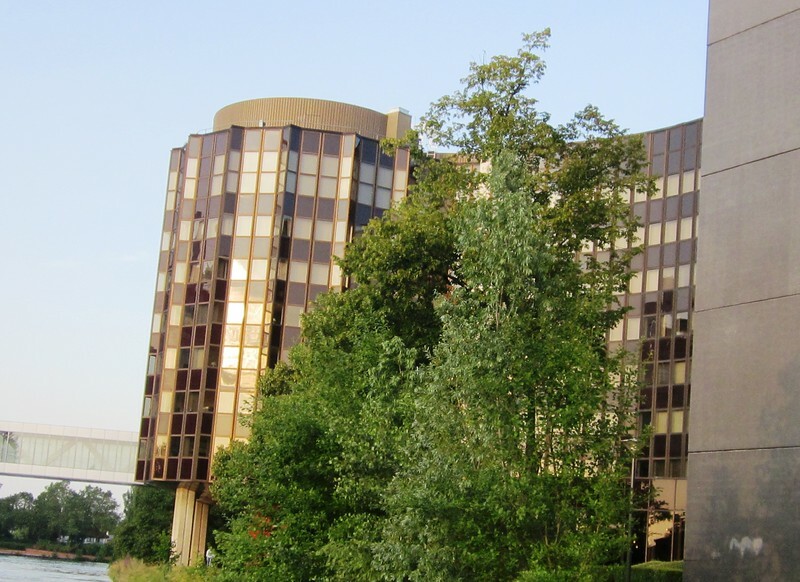 It was easy to locate this tall (60 meters high) cylindrical building made of glass and steel. I recommend you to get your own experience of the European Union democracy at work by attending one of the Parliament’s sessions. The design of the European Court of Human Rights symbolizes the transparency of the Court’s judgments. In a distance, across the Ill River, I observed the illustrious building of the European Court of Human Rights. Designed by Lord Richard Rogers, renowned British architect (who also designed the Centre Georges-Pompidou in Paris), this edifice organically fits the environment and symbolizes the transparent nature of the Court’s judgments. 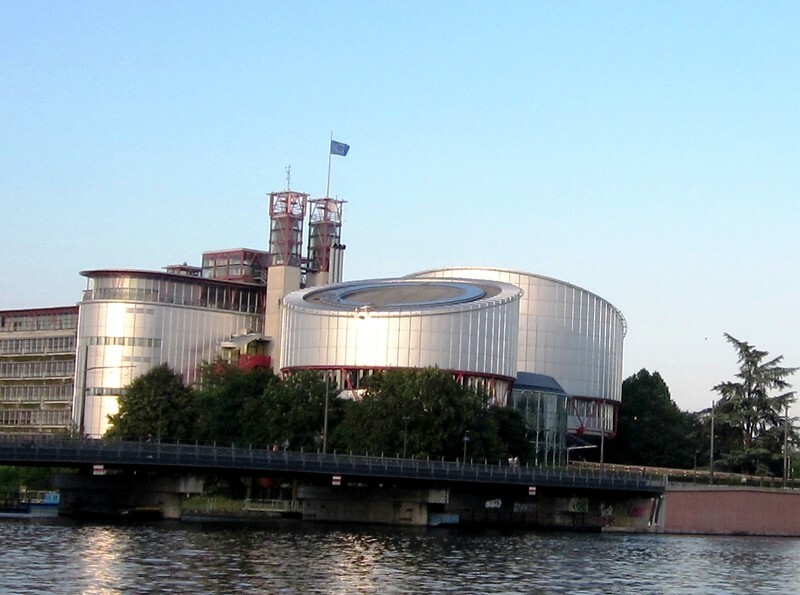 The European Court of Human Rights is the biggest international court in the world’s history. Among its judges was René Cassin, celebrated French jurist, one of the drafters of the Universal Declaration of Human Rights. 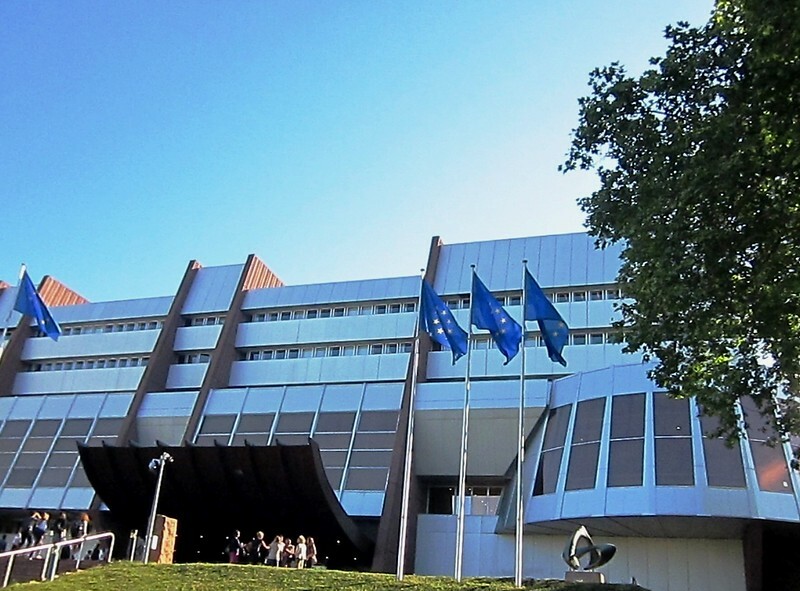 The fortress-like building of the Council of Europe symbolizes the strength of the EU. My last stop in the “European Union” part of Strasbourg was the Council of Europe. To reach it, I walked along the Ill River (Quai du Chanoine Winterer), turned left to cross the bridge, walked along Boulevard Paul Déroulède, turned left to Allée de la Robertsau, and continued onto Avenue de l’Europe. On the left I saw the building of the Council of Europe whose impressive fortress-like architectural design symbolizes the strength of the European Union. In front of its entrance, there are modern artworks and flagpoles with flags of the EU members’ states. The building is shaded by trees which house varieties of birds – I even saw there a magpie! 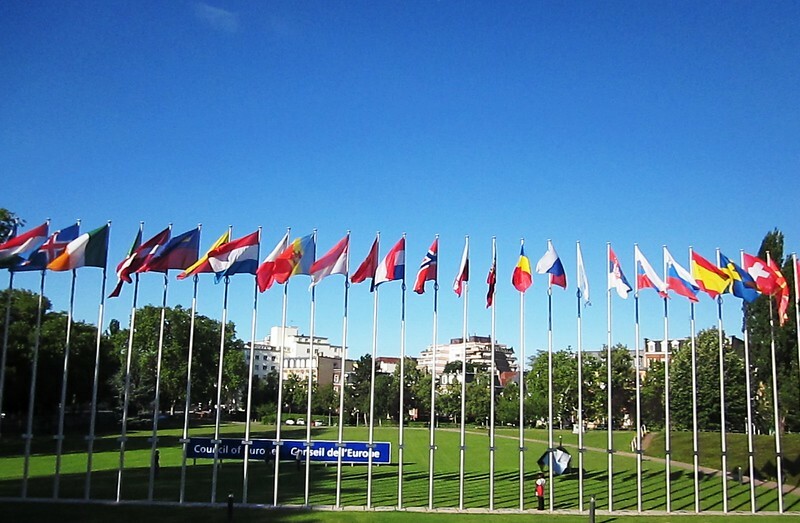 In front of the Council of Europe, there are flagpoles with flags of the Council’s member states. 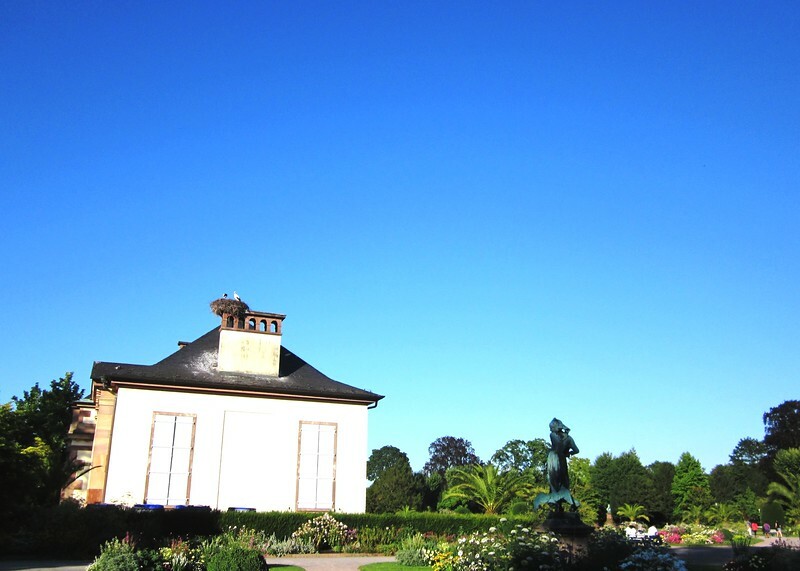 The Orangerie Park, one of the oldest parks of Strasbourg, resembles the gardens of Versailles. 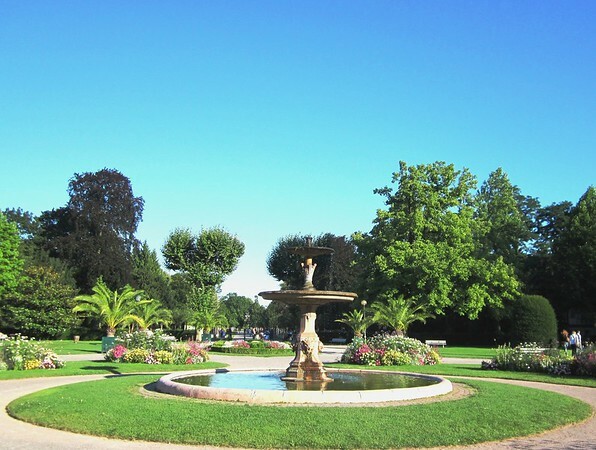 I crossed the Avenue de l’Europe and, after a five-minute walk, found myself in one of the most delightful places of Strasbourg – the Orangerie Park. Dating back to the 17th century, this is the city’s oldest park, famous for its old orange trees (kept in the greenhouse). As I strolled along the alleys, admiring fountains and flower beds, I had a déjà vu feeling: this place resembled the gardens of the Versailles because it has been created by the same gardener, André Le Nôtre. The Josephine Pavilion in the Orangerie Park, the legend says, was a farewell present from Napoleon Bonaparte to his beloved wife Josephine. One of the main buildings here is the Josephine Pavilion built in honor of the Empress Josephine (Napoleon Bonaparte’s first wife) who spent there one night. The original pavilion, destroyed by the fire, has been rebuilt, and now it houses exhibitions, various cultural events, and even storks who built their nest of the roof. 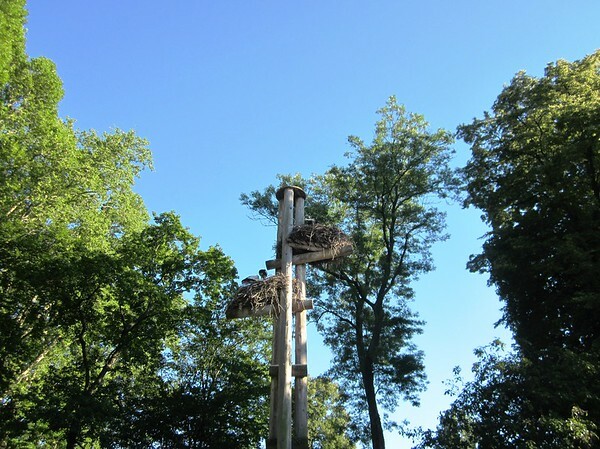 “Stork nursery” in the Orangerie Park is dedicated to the reproduction of wild storks –the symbol of Alsace. Storks, known for their fertility and loyalty, are a symbol of Alsace – and you will see stork-related souvenirs everywhere. In the Orangerie Park there is a “stork nursery”– the reproduction center where birds are raised in captivity to be later released in the nature. While admiring these lovely creatures, I counted about twenty birds of different ages (from “toddlers” to “teens”). Today about 50 stork couples live in Strasbourg, thus, storks’ nests could be found all around the city. To reach my next destination, I walked through the park toward Avenue de l’Europe, turned left to the tram stop “Doits de l’Homme” (Human Rights) and took tram E (direction Campus d’Illkirch) till the stop “Gallia.” After getting off the train, I turned right, walked along the Quai des Pêcheurs, turned right to cross the bridge – and on my left, on Rue des Veaux, I found Au Brasseur, one of the oldest beerhouses in Strasbourg. This is a nice place to taste a tarte flambée (“pie baked in the flames”) – a specialty of Alsace. To make my lunch more “the French style,” I sat at the table outside and observed passerby. Fortified by these great refreshments, I was ready to proceed to the medieval part of Strasbourg. After leaving the beerhouse, I turned left into the narrow Ruelle Saint-Médard, then – right onto;Rue de la Croix, and finally – left onto Rue des Frères which led me to my next stop, the Cathedral Square. The Cathedral of Notre Dame de Strasbourg (Our Lady of Strasbourg) was the world’s tallest building in 1647 and for the next 227 years. The heart of this part of Strasbourg is the Cathedral of Notre Dame de Strasbourg (Our Lady of Strasbourg) or simply the Cathedral. It is impossible to miss this monumental (142 m tall) structure that used to be the world’s tallest building in 1647 and for the next 227 years. Victor Hugo, French novelist, called this great example of Gothic architecture “a gigantic and delicate marvel” – and you can admire yourself its magnificent statues and dazzling stain glass windows. Inside the Cathedral you can find a Renaissance masterpiece – the Astronomical clock which displays animated figures as it strikes noon. The magnificent statues decorate the façade of the Cathedral near its entrance. While walking at the Cathedral Square, the windiest place in the city, you may feel chilly even on a hot summer day. According to the legend, the devil, who was riding the wind, has been locked inside the Cathedral; so, the wind outside is still waiting for the devil to come out . . . 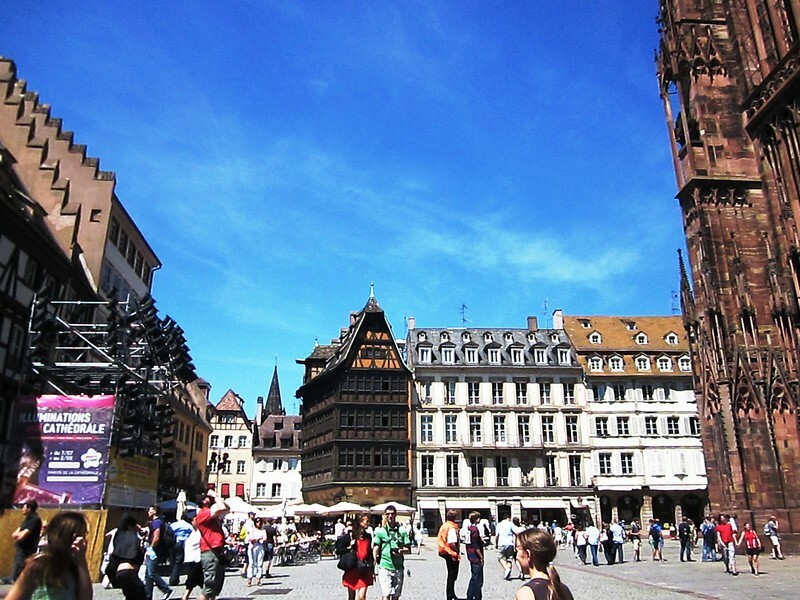 The Cathedral Square and the famous Kammerzell House are architectural jewels of the medieval Strasbourg. Another marvel of the Cathedral Square is the famous the Kammerzell house, one of the city’s oldest building dating back to the 15th century. If you love Gothic architecture, then this house with amazing wooden sculptures on the façade will give you the feast for the eyes! Besides, you would definitely want to return to this place at night to see the fantastic sound and light show at the Cathedral! These free 15-minute long shows start every 30 minutes, so do not worry about being late. Yet now you may want to have a cup of coffee with crêpes (thin French pancakes with a variety of fillings) before we continue our journey. I suggest La Cigogne (The Stork) restaurant – although rather pricey, it will give your memorable impressions as you sip your coffee while looking at the Cathedral! 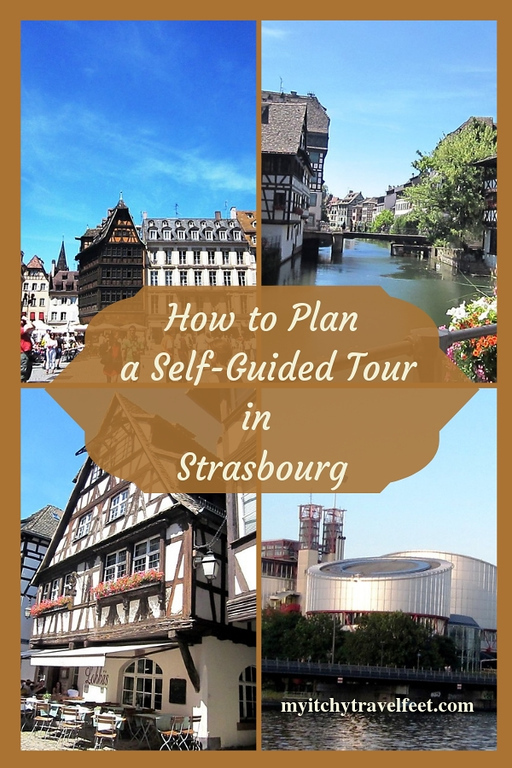 Planning your own boomer adventure in Strasbourg? Start your search for hotels in Strasbourg with us. The Palace of the Rohan – “Versailles in miniature” – houses several museums. Before leaving the medieval part of Strasbourg, we will stop at the Palace of the Rohan called “Versailles in miniature”. This former Episcopal residence now houses several museums. If you love paintings of El Greco and Botticelli, you should visit the Fine Art museum; but if you prefer ancient history, then the Archaeology museum should be your choice. Anyway, each museum will enrich your knowledge about French history and art. The Petite France is one of the most romantic places in Strasbourg. Now we are ready to walk through the downtown to one of the city’s most charming places called “La Petite France” (The Little France). Leaving Place de la Cathédrale (the Cathedral Square), I turned left onto Rue des Hallebardes, and then right onto Place Gutenberg (Gutenberg Square). Walking on cobblestones of these old streets, I was sure glad having my good walking shoes on! I continued my journey strolling on Grand Rue with its numerous shops, turned left onto Rue des Meuniers, then turned right onto Rue du Bain-aux-Plantes. I was almost there – I just needed to turn left onto Rue des Moulins and then – right Quai de la Petite France. 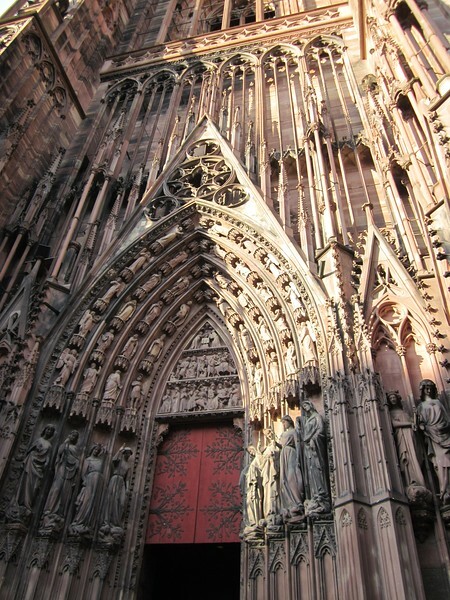 It took me about 15 minutes to reach my final destination – in my opinion, the most astonishing site in Strasbourg! I stood at the edge of the canal observing an ancient lock at work as a tourist boat was going through it. Then I walked around to see old houses that look as though coming from a fairy tale, especially one – the Tanners’ House. The Quai de la Petite France is charming – especially the Tanners’ House (on the right)! For my late lunch I chose a popular restaurant Le Lohkäs famous for its regional cuisine. When in Strasbourg, one had to have choucroute – sauerkraut cooked in white wine and served with assortment of meat (ham, smoked pork, and various sausages). Yes, it was a hearty meal, but after all these walks I deserved it! 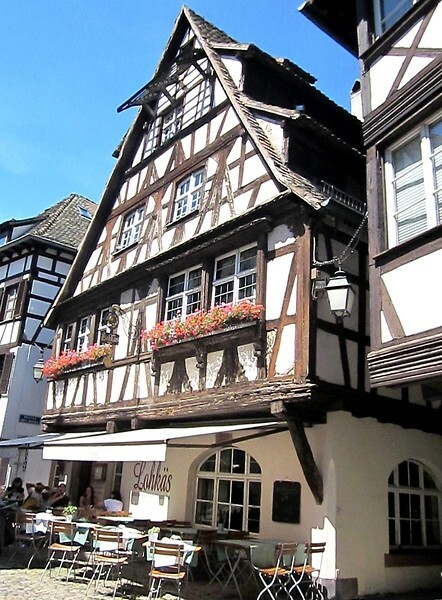 Restaurant Le Lohkäs in the Petite France is famous for its choucroute – a traditional dish of Alsace. And this is the conclusion of my self-guided tour which included many interesting places: I saw European Union institutions, strolled in a park and observed storks, visited the Cathedral and Fine Art museum. During most of my trip I strolled along old streets of Strasbourg and enjoyed its magnificent views. 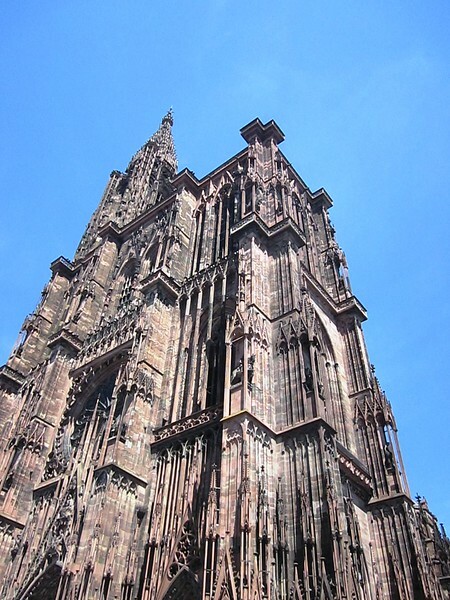 I hope that you also took pleasure in this little journey and find this self-guided tour beneficial as you explore this marvelous French destination – Strasbourg. 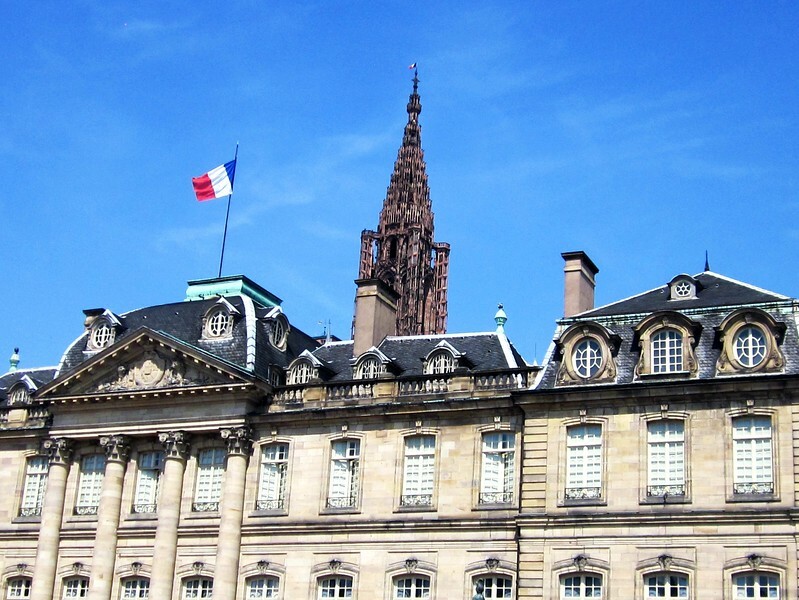 Have you taken a self-guided tour of Strasbourg? Come join the conversation at the My Itchy Travel Feet page on Facebook. Or send us an email with your thoughts. Tatiana Claudy is a freelance writer from Indiana. Her travel articles have been published at TRAVEL THRU HISTORY zine and Go Overseas site.